In an effort to reduce waste I have come up with some unique ways to reuse your orange (and lemon) peels. Stop throwing them away and start reusing your peels today! 1. Add a citrus scent to the kitchen: Place 2-3 ice cubes and your left over orange peels into the kitchen sick. Turn on the garbage disposal until everything is gone. Not only will you have a fresh scent in your kitchen, but your garbage disposal blades will be sharpened and cleaned. 2. Bug repellent: Just take your left over orange peels and rub the inside of the peel on your skin and it will help keep the bugs away. 3. Soften your sugar: Place an orange peel in your sugar canister to keep it from drying out. 4. Keep the cat away: If you have plants or gardens you want to keep your cat out of, just place some orange peels in there and your cat will stay away (cats hate the smell of orange). I have also heard of people using the peels in cooking and for making homemade jams. 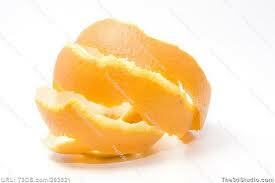 How do you reuse your orange peels?